The Minister of Religion and the Rabbi of the Wall have decreed that “women may not raise their palms to the sky“ or “place their prayer shawl on their head” or say out loud the three lines of the Priestly Blessing. tallit on their heads and reciting the Priestly Blessing. Wall Shmuel Rabinowitz. Tomorrow the two of them will participate in the Priestly Blessing for men. 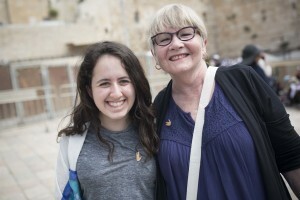 Every participant received a Priestly Blessing pin commemorating today’s prayer. The pin was derived from the hand symbol employed in Star Trek by Mr. Spock, a role played by the Jewish actor Leonard Nimoy (z”l). Nimoy made the Blessing, “Live long and prosper” an international symbol. contrary to local custom, and it is through our persistence that these are now local custom.